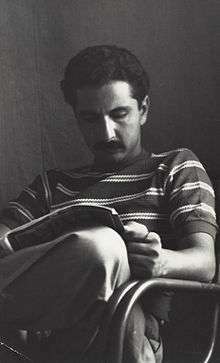 Siavash Kasrai (Persian: سیاوش کسرائی‎‎; February 25, 1927 in Isfahan – February 8, 1996 in Vienna) was an Iranian poet, literary critic, and novelist. An active supporter of the Communist Tudeh Party of Iran from the late 1940s to the mid 1980s, he distanced himself from its leadership in 1988-90, and turned into an outspoken critic in the mid 1990s. Siavash Kasrai was born into a family of officials, some (his uncle Abdol-Karim Kasrai in particular) with a serious interest in literature. In Tehran since his early age, he received his primary education at Adab School, and secondary education at the Military College and Dar ul-Funun. He graduated from the University of Tehran, Faculty of Law, in 1950, and did his military service at the Military Academy. In the early 1950s, Kasrai served at the Iranian Health Cooperation Agency, created under Truman’s Point Four Program, and headed two of the agency’s periodicals (Behdashte Hamegani dar Nahiyeye Dariaye Khazar, Zendegi o Behdasht). From the mid 1950s to the early 1980s, Kasrai almost continuously served in government bodies focusing on housing or urban development: the Iranian Bank of Housing, the Housing Agency, and the Ministry of Housing and Urbanization. In the early to mid 1970s, in a forced leave from the Ministry, he worked a few years as chief copywriter for the Behshahr Industrial Group. In addition to his regular employment, Kasrai occasionnally taught literature at the Universities of Tehran and Zahedan. During his secondary education, Kasrai was part of a group of young nationalists including Dariush Forouhar and Mohsen Pezeshkpour. In 1948 he became member of the Tudeh Party, which he actively supported during the next four decades. Kasrai was shortly imprisoned in the aftermath of 1953 overthrow of Mohammad Mosaddegh. He was a founding member of the Iranian Writers’ Association, and one of its elected secretaries in the first four years of its existence, from 1968 to 1971. Kasrai took part in 1977 Tehran Goethe-Institut nights of poetry readings, a noted public event with dissident overtones in the pre-Iranian Revolution period. As a result of a post-revolution crackdown on Tudeh supporters, he left Iran in 1983, resided in Kabul until late 1987, in Moscow until 1995, and then in Vienna. Kasrai was elected to the Tudeh Party Political Bureau in 1986. He resigned from the party’s Bureau in 1988 and from its Central Committee in 1990. Kasrai’s last major work (Mohreye Sorkh), published in 1995, was a public expression of disappointment with Communist activity. Kasrai had an intense social life, informed by his intellectual interests and an ethic of solidarity. He was, at various junctures, in close personal relationships with such literary figures as Iraj Afshar, Ahmadreza Ahmadi, Houshang Ebtehaj (alias H. E. Sayeh), Mahmoud Etemadzadeh (alias M. E. Behazin), Forough Farrokhzad, Morteza Keyvan, Nader Naderpour, Shahrokh Meskoob, Fereydoon Moshiri, Brayim Younisi, and Nima Yooshij. He was holding informal eclectic salons at both his office and his home on an almost daily basis from the early 1960s to the early 1980s. 1959. Arashe Kamangir. Tehran: Andishe. 1962. Khune Siavash. Tehran: Amir Kabir. 1966a. Ba Damavande Khamush. Tehran: Sa’eb. 1966b. Sang o Shabnam. Tehran: Sa’eb. 1967a. Ba’d az Zemestan dar Abadiye Ma. Tehran: Kanune Parvareshe Fekriye Kudakan va Nojavanan. 1975. Chehreye Mardomiye She’re Nima. University of Zahedan. Duplicated. 1978. Az Ghorogh ta Khoruskhan. Tehran: Maziar. 1979. Amrika, Amrika. Tehran: Elm o Honar. 1981. Chehel Kelid. Tehran: Tudeh Party of Iran. 1983. Tarashehaye Tabar. Kabul: Pohantun Cultural Assembly. 1984a. Hediyei baraye Khak. London: Bina. 1984b. Peyvand. Kabul: Tudeh Party of Iran. 1989. Setaregane Sepidedam. London: Bina. 1995. Mohreye Sorkh. Vienna: Kara. 2003a. Dar Havaye Morghe Amin: Naghdha, Gofteguha, va Dastanha. Tehran: Ketabe Nader Publications. 2003b. Havaye Aftab: Vapasin Sorudeha. Tehran: Ketabe Nader Publications. These are all books of poetry, except the 1967a (a children book), 1975 (a piece of literary criticism), and 2003a (including literary criticism, interviews, and novels) publications. Kasrai’s complete collection of poems was published as a 773 pages octavo in 2005 in Tehran by Ketabe Nader Publications, under the title Az Ava ta Havaye Aftab. The second publication, Arashe Kamangir, brought public recognition to Kasrai. Arash is a legendary figure saving his country from the humiliation and misery of defeat by putting his soul into an arrow, which will travel over and gain back lost territory. Kasrai’s version is the first epic poem in Nima Yooshij’s style, or more generally the first epic instance of Persian new poetry. The poem was dedicated to Khosro Roozbeh, a radical leftist executed in early 1958. In spite of what appeared to some as technical weakness, and in spite of the authors’ proposed dissident interpretation, Kasrai’s Arashe Kamangir was one of the few contemporary poems to find its way in schoolbooks. Abedi, Kamyar. 2000. Shabane Bozorge Omid: Barresiye Zendegi va Asare Siavashe Kasrai. Tehran: Ketabe Nader Publications. Abedi, Kamyar. 2009. Kasra’i, Siavash. In Encyclopædia Iranica, edited by Ehsan Yarshater et alii, online edition. Kasrai, Siavash. Undated, probably mid 1980s. Autobiographical Notes. Kasrai Papers. Kasrai, Siavash. 1990. Communication to the April 1990 Tudeh Party Central Committee Plenum. Kasrai Papers. Kasrai, Siavash. 2003. Mohreye Sorkh. Vienna: Kara, 1995. Reprint, Tehran: Ketabe Nader Publications. Contemporary Persian and Classical Persian are the same language, but writers since 1900 are classified as contemporary. At one time, Persian was a common cultural language of much of the non-Arabic Islamic world. Today it is the official language of Iran, Tajikistan and one of the two official languages of Afghanistan.